Behold! Ladies and jellyspoons, allow me to present the mysterious object which has haunted my sociological brain for the past five weeks. Can you spot the two lines in this drugstore receipt that made my brain make a sound like this? I was so overjoyed to finally be able to buy my favorite toothpaste again, after almost 25 years, that I almost failed to notice that my cash register receipt stated the price of my two tubes of Oligodent (gout verveine) not only in euros, but in French francs–a currency that was supplanted by the euro more than 10 years ago. The French were probably more aware of that transition than anyone else, because they minted the first euro coin in history, in May 1998! When the euro became the country’s official currency on the 1st of January 1999, the exchange rate was forever fixed at the rate shown on the receipt: 6.55957 francs to the euro. By now, that conversion ought to be old hat, right? 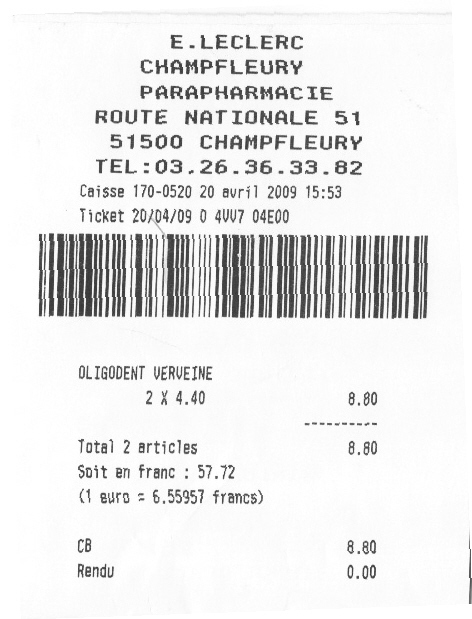 While it’s certainly considerate and pragmatic to provide “dual pricing” information during a period of transition–francs were accepted as legal tender in the French economy, in parallel with the euro, until January 2002–it’s a little surprising to see it still in use after a decade. 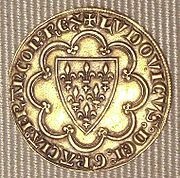 An écu minted by Louis IX. If they’re going to do that, I wondered, why not go all the way and show the value of a euro purchase in terms of the écu–the defining currency of France, which served her from the Middle Ages through the Enlightenment, from the reign of Louis IX (who minted the first écu in 1266) through that of Louis XVI (who lost his head in the Revolution of 1789)? The écu disappeared during the French Revolution, but the 5 franc silver coins minted throughout the 19th century were but the continuation of the old écus, and were often still called écu by French people. This took me back to the mid-1980s, when I spent my senior year of high school living with a French family, in which the parents still talked about prices in terms of “old” francs–a currency that had ceased to exist 25 years before! And today, living in Germany, it’s still very common to hear people talk about contemporary prices in terms of Deutsche marks, even though they went out of circulation over seven years ago, and you never see dual pricing (i.e., prices in both euros and marks) in stores or on receipts. People just do the math in their heads (clever people, those Germans). It makes some sense for them to keep referring to marks, however, because their national bank (the Deutsche Bundesbank) has agreed to redeem marks for euros indefinitely: that is, should you happen to find a 100 mark note stashed away in a vintage purse, you can take it to any branch of the Deutsche Bundesbank worldwide and get it exchanged for euros, at the irrevocable rate of DM 1.95583 = one euro. It’s not like that in France, however: the Banque de France stopped exchanging 100 franc notes for euros in February of this year, and will stop exchanging all other denominations of franc notes as of February 2012. (Pity the holders of the 12.4 million 100 franc notes that are still floating around unredeemed! And someone please inform the gentleman with 40 thousand French francs in his fridge.) This means that while the Deutsche mark will always have some exchange value, the French franc will soon be no more than a pretty piece of paper. Which makes the attempts by the French people to keep the franc alive through dual pricing even more puzzling. Institutions are social structures that have attained a high degree of resilience. [They] are composed of cultural-cognitive, normative, and regulative elements that, together with associated activities and resources, provide stability and meaning to social life. Institutions are transmitted by various types of carriers, including symbolic systems, relational systems, routines, and artifacts (2001: 48). “Resilience”? Check. “Stability and meaning”? Check. “Symbolic systems” and “artifacts”? Check and check. According to the original schedule [Franc] notes and coins were to be withdrawn in February 2002, and dual pricing in Francs and Euros would end at the beginning of the following year. The notes and coins duly disappeared more or less on schedule. Dual pricing should have disappeared by now, but the schedule has had to be revised under the pressure of popular opinion. Business who had already switched to pricing only in Euros have had to restart labelling prices in Francs as well. Too many people simply do not like the new currency. That’s right: French people keep three parallel currency systems running in their head at any given time. As if that weren’t impressive enough, they also apply those price measurements selectively, based on the value of the item in question: the price of trifles can be expressed in euros, but something truly precious can only be priced in old (pre-1960) francs! This seems closely related to that classic status distinction among the rich: those who represent “old” money enjoy more prestige than the nouveaux riches, even if their net worth is identical to the penny. There’s something complicated happening here, involving not just money and memory, but also status and value, in the broadest sense of the term. This is where sociology and anthropology really part ways with economics. While economists can acknowledge that there is more going on with currency than its material exchange value, they’re generally not interested in finding out what that “more” is (unless they can repackage sociology and anthropology as Freakonomics–which represents a whole disciplinary status war in its own right) because they don’t (yet?) have the means to shoehorn institutions and culture into tidy mathematical models. Fortunately, sociologists and anthropologists are under no such obligation to force the messy, multi-faceted world of human behavior into the economists’ Procrustean bed. Many of us still do quantitative analyses, but our professional norms place far more value on empirical data than on elegant mathematical models. If you’re interested in learning more about the differences between economics and economic sociology, this classic article is a good place to start. And for a fascinating visual representation of the geographical path of euros through France via trade with neighboring countries, click here. * For those who have not already noticed, I feel obliged to point out that this title includes a bilingual pun. Thank you. Don’t forget to tip your waitress. This post represents something of a departure from the usual themes of this blog, since it does not deal directly with questions of economic behavior, money or markets. However, it does address “big picture” issues in scientific inquiry, which affect all realms of sociological research. Specifically, the post builds on an analogy drawn by Wolfgang Streeck in his new book, Re-Forming Capitalism: Institutional Change in the German Political Economy (Oxford 2009). His account of epistemology in social science, and its resemblance to the advance of knowledge within evolutionary theory, struck me–to my surprise–as a particularly compelling way to frame the contribution of qualitative research to sociology. The devaluation of qualitative sociology as “unscientific” and of dubious value compared to quantitative research has always struck me as ill-considered; Streeck’s work provided a way to articulate a response that went right to the heart of the debate. Early in the book, Streeck raises “the possibility of the theory of biological evolution…serving as a model for social history” (p. 11). It’s an extraordinarily fruitful idea, with wide-ranging implications. The pursuit of knowledge through data sources such as archival research, content analysis and participant observation turns out to have a surprising amount in common with evolutionary theory. Yet qualitative research faces ongoing threats to its legitimacy, even within sociology. The fallacies of these legitimacy challenges will be the subject of this post, drawing on and extending Streeck’s analogy between sociology and research on evolution. Classical social science examined how the modern way of life had evolved out of the past…and the evolution of the emerging political-economic institutions of capitalist society. In contrast, sociology occupies a far more tenuous position, often treated as a pseudo-science or a “wannabe” science particularly when it comes to qualitative work. As of 2006, 95 percent of Americans agreed that biology—of which evolutionary theory is a part—was a science, but only about half that many (49 percent) thought sociology was; a full 8 percent said they’d never heard of sociology in the first place! Making matters worse, sociologists themselves disagree as to whether their discipline is a science. Qualitative sociology has been at the center of these attacks—often devalued as “mere description,” making it indistinguishable (in the eyes of some) from non-scientific endeavors like history and journalism. These legitimacy challenges to the status of qualitative research as part of the scientific endeavor has been growing since the “quantitative revolution”—the rise of computer-assisted calculation—swept through sociology starting in the 1950s. Why evolutionary theory and quantitative sociology aren't such a good fit? Like qualitative sociology, evolutionary theory has been subject to widespread misunderstanding about its ability to make predictions. While evolutionary theory can’t predict exactly how animals and plants will evolve, it can make predictions that guide future research, as the cases of Tiktaalik roseae and the naked mole-rat illustrate. It does this by looking backward, explaining how things came to be, then using that method to construct and validate models that can be extrapolated into the future. Sometimes, this process results in highly specific predictions—like those surrounding changes in the appearance of the Peppered Moth in Great Britain during recent decades—other times in more generalized conjectures, such as warnings about the possibility of a “mass extinction event” if global biodiversity continues to decline at its present rate.These methods of advancing knowledge have close parallels in qualitative sociology. For example, the ability of qualitative sociology to generate theory inductively, through means such as grounded theory development, is fairly well-accepted. This process includes the formulation of causal models and hypotheses, which means that qualitative research can create testable (and falsifiable) predictions—an essential characteristic in the definition of science. 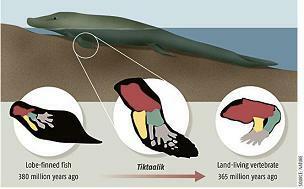 It's all in the wrist: Tiktaalik roseae as the missing link between fish and land animals. However, the rigor of theory testing is often thought to be beyond the scope of qualitative research—an assumption that persists despite a multitude of peer-reviewed, published studies demonstrating the contrary. Another important commonality between evolutionary theory and qualitative sociology is their direct engagement with historical change. Evolution is first and foremost about processes of transformation in the natural world, and qualitative sociology excels at this kind of explanation in the social realm, particularly when it comes to addressing phenomena such as the effects of repeated interactions on groups and institutions. Both domains of research recognize that there is an irreducible element of stochastic change—that is, unpredictability—over time within any complex system. And while their temporal scales are certainly different—evolution deals with change over thousands of years, while sociology rarely looks at more than a century’s worth of data—they share the basic viewpoint that history matters and that one purpose of inquiry is to explain how. While some notable sociologists—such as Mark Granovetter, whose undergraduate degree is in history—have pointed out that sociological research can and should acknowledge the impact of “embeddedness,” regardless of the research methods employed, much of discipline has fallen into “temporal reductionism”—“treating relations and structures of relations as if they had no history.”  This is particularly strange, because as Streeck points out in his new book, explaining historical change was one of the core objectives of the emerging social sciences in the 19th century. Yet paradoxically, in its quest to become more “scientific” in the 20th century and beyond, the discipline modeled itself on “nineteenth-century mechanics,” resulting in the “search by much of current social science for historically universal, invariant principles governing social organization” (p. 12).Streeck does not elaborate here on the methodological consequences of this selection, but a definition of “science” as the discovery of mechanistic laws that transcend time and space would seem to exclude virtually anything but quantitative research. At the same time, this (mis)understanding of science devalues qualitative inquiry, making many sociologists “afraid of being accused of ‘atheoretical storytelling’” (p. 12). Thus sociology finds itself in the peculiar position of seeming to delegitimate its own origins. Among the most regrettable consequences of this is the limitations it imposes on what sociology can achieve: that is, the kinds of questions it can address, and the kinds of answers it can offer. In the latter case, as Streeck points out, we are confronted with many instances of “ahistorical theory-building” (p. 12), whose explanatory power leaves much to be desired. Perhaps even more troubling, the devaluing of qualitative research has the perverse effect (for a discipline that purportedly seeks “universals”) of reducing sociology’s ability to engage with the big-picture questions of the social world—like “how did capitalism arise where and when it did?”Because evolution can address big-picture questions without having to defend its status as a science, it has made a good deal of progress on issues like the origins of life on Earth. The downside of trying to do big-picture science is that it leads into the messy terrain of complex systems: ones that combine elements of randomness with strong patterns of historicity. Acknowledging these forces is a strength of evolutionary theory, as well as of qualitative forms of sociological research—good reasons to embrace the latter as part of the social scientific endeavor. While Streeck’s point about the links between sociological theory and evolution was incidental to his larger aims in the new book, he contributes an important insight on the puzzling status of qualitative research in contemporary sociology. The computing revolution, along with the long-standing popular view of sociology as mere common sense—a misconception that remains surprisingly robust, despite having been tackled by Max Weber nearly a century ago—have all contributed to the problem. Sociology’s ill-fated efforts to achieve scientific legitimacy by modeling itself on the physical sciences have been noted by others; but Streeck does something entirely new, suggesting that the problem is not that sociology is unscientific, but that sociologists have been modeling their work on the wrong kind of science—and an outmoded type at that! His simple observation suggests something rather radical: instead of trying (and failing) to be like 19th century physics, sociology would play to its own strengths and contribute more to knowledge by building on its commonalties with evolutionary theory. One way to start this paradigm shift, as I see it, is to start by recognizing the scientific value of qualitative research, based on its ability to address complex, big-picture questions, and to offer explanations that account for conflict and change—things we often miss by privileging quantitative sociology. Granovetter, Mark. 1992. “Problems of Explanation in Economic Sociology.” In Nohria, Nitin and Eccles, Robert (Eds. ), Networks and Organizations,Boston: Harvard University Press. p. 34.